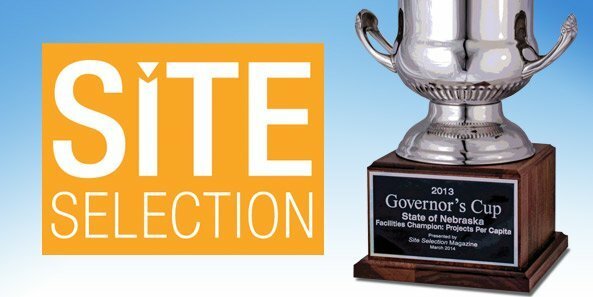 According to Site Selection, The Magazine of Corporate Real Estate Strategy & Area Economic Development, Nebraska Wins the Magazine’s Governor’s Cup. Peyton Manning isn’t the only person shouting “Omaha! Omaha!” these days. Omaha is also on the lips of corporations looking for places to call home, according to Site Selection magazine, an industry publication that focuses on helping expansion planners select locations. And Nebraska is the top state per one million residents to earn the Governor’s Cup for attracting business to the state. While more populous states, like Texas which was #1 with 670 new projects in 2013, and Ohio with 480, will always win more business when compared on the size of the population, Nebraska more than holds its own. And the Omaha-Council Bluffs metropolitan area does the same for cities with populations of 200,000 to one million. Other corporate expansions include a $10 million Yahoo expansion adding 100 jobs, and Fidelity’s $200-million data center. Also mentioned by the magazine are EagleMed’s expansion in Scottsbluff and Teledyne Technologies’ plans to invest $12 million and hire 100 new employees in Lincoln. The viral spread of Omaha! Omaha! as a pre-hike code word for Payton Manning during the National Football League playoffs and Super Bowl raised the city’s visibility — and the Greater Omaha Chamber of Commerce is determined to keep the city high on the playbooks for site selectors in the future. According to data used by Site Selection magazine, the Omaha metro led all cities of 200,000 to one million residents in corporate facility investment projects. Just for the record, the Omaha metro area is 900,000 in population and the city landed 48 corporate facility projects in 2013. Allentown, Pennsylvania, and Baton Rouge, Louisiana, tied for second. David Brown, president and CEO of the Greater Omaha Chamber of Commerce cites the city’s combination of infrastructure, low power and utility costs as reasons companies invest in the area.